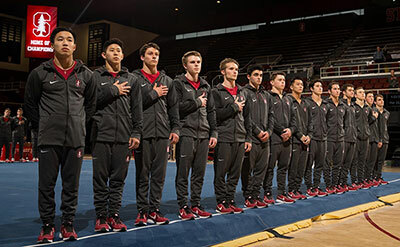 CHICAGO, April 20, 2018 – Stanford University posted the top score in the first of two qualifying rounds at the 2018 NCAA Men’s Gymnastics Championships at UIC Pavilion on the campus of the University of Illinois at Chicago. The University of Minnesota and the University of Nebraska round out the top three, which advance to tomorrow’s team final. Competition resumes tonight at 7 p.m. CT, featuring the three-time reigning national champion and top ranked University of Oklahoma, along with the University of Illinois, Ohio State University, Pennsylvania State University, University of Iowa and University of California at Berkeley. Stanford topped the team standings in the first qualifier with a 407.390 total. Minnesota placed second at 404.758 followed by Nebraska in third (402.690). The other schools competing in the team competition in this session were the University of Michigan, fourth at 400.590; U.S. Naval Academy, 390.921, fifth; and the U.S. Air Force Academy, 385.688, sixth. In the all-around, Stanford’s Ryan Sheppard posted the first session’s top mark of 80.865. Cameron Bock of Michigan (80.765) and Minnesota’s Tristan Duran (80.166) round out the top three. In addition to the top three teams, the top three all-around competitors and the top three individuals for each event, who are not members of one of the qualifying teams from each qualifying session, advance to the finals. The following is an overview of how fans can follow the action from Chicago. All times are Central. The competition will be live streamed on NCAA.com.